Make the most of your short one day visit to Malta! We offer an excellent range of Shore Excursions including the popular Hop On/Hop Off bus tours, half or full day tours by land or boat. If you prefer a private tour just for you and your group click here for more information. All of our tours pick-up direct from the cruise terminal, just a few hundred metres from the ship berth and return same at the end of the tour.You can view the pick up/drop off point by clicking on the image on the right. We are aware that cruise liners have strict guidelines on disembarkation and embarkation times. Therefore as a general rule we suggest that tours with a pick up time of 30 minutes or later after arrival and a drop off 1 hour or earlier before you are due to depart, are considered as suitable. To check what tours are available on the date you are visiting simply enter the date in the search box above and hit Find. We wish you, your family and friends an enjoyable visit to Malta. Booking your shore excursion online is easy. Fill in the booking form, enter your travel dates and personal details. There are no credit card or booking fees and you will receive and instant confirmation. Book now to guarantee availability. Payment is charged 14 days before the tour/attraction date. We do not charge credit card or booking fees for any of or tours. Q If I book a tour is it immediately confirmed? Q Do you pick-up from the port/cruise ship terminal for all the tours? The tours that are available in the Shore Excursions section include a pick up from the port. 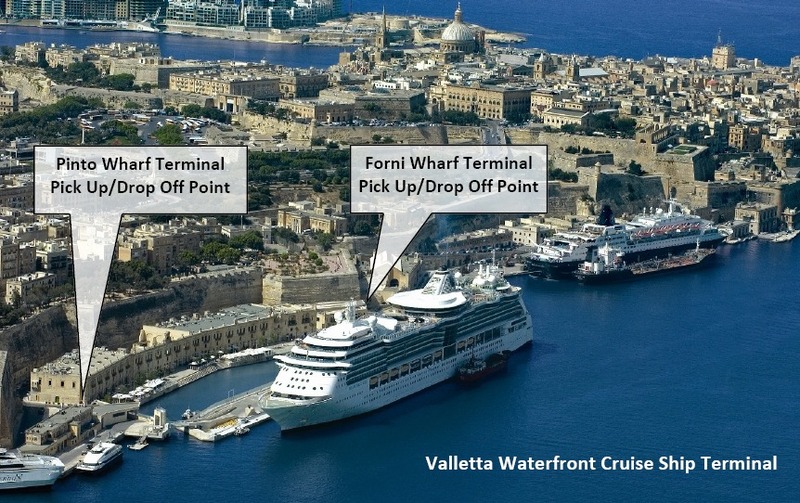 The pick up point is located close to all berthing points on the Valletta waterfront. Pick up time/point will be printed on your Tour Voucher. Q We are restricted to times. What time do the tours start and end? All of our tours pick-up direct from the cruise terminal, just a few hundred metres from the ship berth and return same at the end of the tour. We are aware that cruise liners have strict guidelines on disembarkation and embarkation times. Therefore as a general rule we suggest that tours with a pick up time of 30 minutes or later after arrival and a drop off 1 hour or sooner before you are due to depart, are considered as suitable. All tours are different. You can check exactly whats is included on the tour details page. Malta TravelNet Services Ltd. is licensed by the Malta Tourism Authorities to operate incoming travel services, local tours and to act booking agents for other tour operators. Our operators license number is TRA/M50 and this is clearly displayed on the website. You can cancel a tour or shore excursion up to 15 days before the tour date and you will not incur any charges at all. If you have to cancel the tour for any of the following reasons we will do our utmost to refund/part refund provided that we are advanced at least 72 hours in advance. 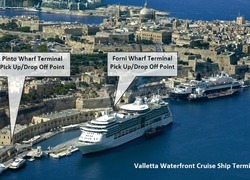 c) The cruise liners changes the itinerary and you will not arrive in Malta. If you are arriving on a cruise ship, it would be very unlikely that we can organise a tour for you if you book on arrival in Malta. All tours featured on this website are scheduled to operate and therefore guaranteed. The tour will not operate if the tour operator/supplier is forced to cancel for any reason which may include adverse weather, operational and technical reasons or any other reasons which forces the tour operator/supplier to cancel.